Coronal tooth fractures are common among school-age children and adolescents. They can cause serious functional, esthetic, and emotional problems for patients as well as for their parents. Dental injuries usually affect only a single tooth; however, trauma involving motor vehicle accidents and contact sports injuries can include multiple tooth injuries. Factors influencing the management of coronal tooth fractures are extent of fracture (biological width encroachment, endodontic involvement, alveolar bone fracture), path of fracture and restorability of fractured tooth, secondary traumatic injuries (soft tissue status), availability of fractured tooth fragment and its condition for use (adaptation between fragment and the remaining tooth structure), occlusion, esthetics, and prognosis. The level of fracture is an important factor in determining the line of treatment and its outcome especially when the dentogingival complex is compromised. The reattachment of the fractured fragment to the fractured tooth using adhesive techniques offers advantages such as the re-establishment of function, esthetics, texture, shape and surface brightness, in addition to maintaining the original alignment of the restored teeth. This article reports on two coronal tooth fracture cases that were successfully treated using tooth fragment reattachment. A 25-year-old male patient reported to our department with fractured maxillary right lateral incisor [Figure 1]a and [Figure 1]b. On examination, it was found that there was a complex oblique fracture of the crown. The reattachment of the fragment using fiber post was planned. Local anesthesia was given, and the segment was recovered with minimal force from its soft-tissue attachment and stored in sterile distilled water to prevent dehydration and discoloration [Figure 1]c and [Figure 1]d. The working length was confirmed with radiograph. The root canal was enlarged to ISO size 70 at working length. Three percent sodium hypochlorite solution was used during the biomechanical preparation. The root canal was dried with absorbent paper points and obturated using endodontic sealer and laterally condensed with gutta-percha. Gutta-percha filling was removed from coronal 2/3rd of the canal retaining approximately 4–5 mm of gutta-percha apically. Postspace preparation was done with a Peeso reamer of size 3 to place a fiber post [Figure 1]e and [Figure 1]f. Coronal portion of the fiber post was cut to fit into the coronal fractured fragment. Both fractured crown and root fragments were etched with 37% orthophosphoric acid, rinsed, blot dried, followed by application of a dentin bonding agent. Dual cure resin cement was placed in the canal followed by a fiber post up to proper length and the fragment was reattached to the tooth. Excess cement along the margins was scraped using blade and light cured with curing light for 30 s. The fracture line was examined and polished with polishing disks [Figure 1]g and [Figure 1]h. Occlusion was checked and postoperative instructions were given to the patient. Follow-up examinations were carried out at 6 months and 1 year intervals respectively, and no postoperative complications were reported. A 21-year-old male patient reported with fracture of maxillary right central incisor [Figure 2]a. On examination, it was suspected to be vertical fracture. After removal of fragment under anesthesia, it was diagnosed as vertical crown-root fracture extending from cervical to middle third of root. After careful inspection, intentional replantation of root along with reattachment of fragments with fiber post was planned. Treatment was carried out under local anesthesia (lignocaine with 1:100,000 epinephrine). Access opening was done, and working length was determined before extraction [Figure 2]b. The tooth was extracted as atraumatically as possible, and the two fractured fragments were also recovered and kept on moistened gauze. The alveolar socket was also carefully irrigated with isotonic saline [Figure 2]c and [Figure 2]d.
The extracted tooth was inspected and confirmed for no additional fracture. The fractured fragments and the tooth were etched at the fracture margins with 37% phosphoric acid and then washed and air dried. The bonding agent was brushed over the etched fragments and light cured for 20 s followed by reattachment of a fragment with dual cure resin cement. The resin cement was light cured for 20 s. Root canal treatment of the tooth was completed with gutta-percha points and epoxy resin-based root canal sealer AH-plus extra-orally by sectional obturation method [Figure 2]e. A fiber post was placed up to proper length and core buildup was carried out with composite resin [Figure 2]f. After the composite resin setting was completed, the root surfaces were treated with tetracycline solution for 30 s and tooth was replanted to its original position at the alveolar socket. A nonrigid fiber splint was applied to stabilize the tooth. A postoperative radiograph was taken [Figure 2]g. The total extra-oral time was 30 mins. Postoperative instructions were given to patient along with a soft diet for a week and careful brushing after every meal. Doxycycline 100 mg BID was prescribed for 1 week. After 15 days, the splint was removed. There was good healing of gingiva with no evidence of periapical infection [Figure 2]h. The patient was recalled regularly for follow-up at 6 months and 1 year intervals, respectively, intraoral periapical radiograph at the last visit showed no signs of resorption or ankylosis. Facial injury results in fractured, uprooted, or lost teeth which have a significant negative impact on function, esthetic, and emotions of the patient. A patient with fractured anterior teeth usually reports with a complaint of pain and is psychologically upset and disturbed about his or her facial appearance. Esthetic restoration and relief of discomfort for such patients within a single appointment by preserving the natural tooth may lead to a positive emotional and social impact for the patient. This is especially applicable in a scenario in which there is minimal or no loss of the biological width, and the fractured fragment is retained. One of the options for managing such coronal tooth fractures is the reattachment of the fractured fragment. Fracture reattachment by fiber post is simple, economical, and less time-consuming and provides excellent results. Factors influencing the extent and feasibility of such repa	ir include the site of fracture, size of fractured remnants, periodontal status and pulpal involvement, maturity of root formation, biological width invasion, occlusion, time, and resources of the patient. Reinforcement of the reattached fragments using posts has been widely reported in the literature. Although many techniques with several materials have been suggested, resin-based restorative materials with tooth-colored fiber post may be considered the best option because of several advantages such as a suitable elastic modulus, esthetics, good bonding between post and cement, lower chairside time, and minimal tissue removal. Nonmetallic posts are made of either ceramic or fiber reinforced materials such as carbon, quartz, or glass in an epoxy resin matrix. Using glass fiber post with composite resin core along with recent advancements in adhesive techniques and materials, one can create a Monobloc. With the advent of newer generation dentin bonding agents and adhesive materials, reattachment of the fractured fragments has become a reliable treatment modality. Reattached teeth are resistant to shear stresses, similar to the intact teeth. Use of prefabricated post provides good retention and the distribution of forces along the root surface. According to the amount of the restoration, cast posts screw posts or auxiliary pins can be used for supporting the fragment. The possible complications after reattachment include change in color of the attached fragment and fractured reattached teeth that show a high degree of failure with new trauma. However, long-term follow-up of cases is necessary to evaluate the longevity of reattached teeth, lack of which is a limitation in our cases. Andreasen JO, Andreasen F, Andersson L. Textbook and Color Atlas of Traumaticinjuries to the Teeth. 3rd ed. St Louis (MO): Mosby; 1994. Reis A, Francci C, Loguercio AD, Carrilho MR, Filho LE. Re-attachment of anterior fractured teeth: Fracture strength using different techniques. Oper Dent 2001;26:287-94. Martos J, Majzoob YM, Signori C, Silveira LFM. 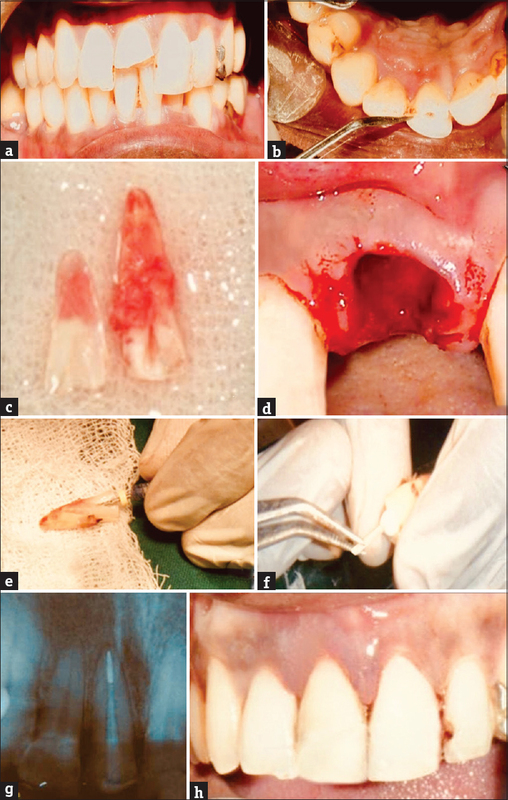 Adhesive crown fragment reattachment in anterior-fractured tooth. J Res Dent 2014;2:54-6. Guidelines on Management of Acute Facial Trauma; American Academy of Pediatric Dentistry; Clinical Guidelines; 2007. p. 175-83. Choudhary A, Garg R, Bhalla A, Khatri RK. Tooth fragment reattachment: An esthetic, biological restoration. J Nat Sci Biol Med 2015;6:205-7. Pathan M, Gaddalay S. Reattachment of anterior teeth fragments: A case report. Int J Appl Decis Sci 2017;3:101-3. 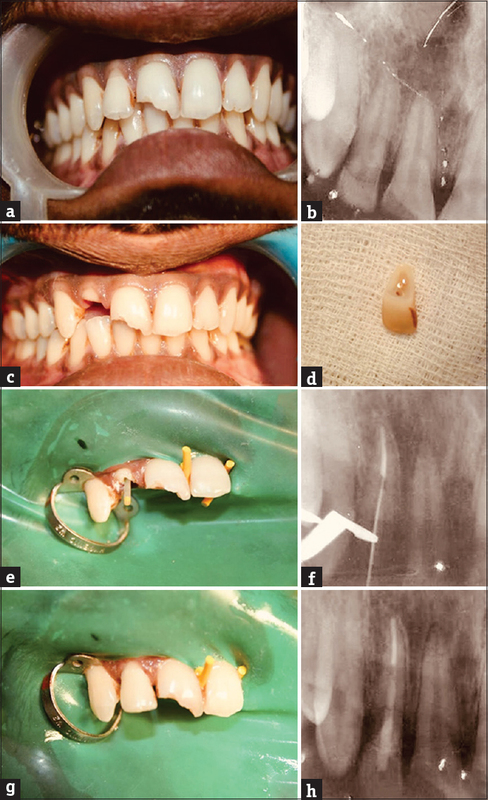 Sapna CM, Priya R, Sreedevi NB, Rajan RR, Kumar R. Reattachment of fractured tooth fragment with fiber post: A case series with 1-year follow up. Case Rep Dent 2014;2014:1-5. Jambagi NM, Joshi SB. Reattachment of fractured fragment with pin-point pulp exposure in a mature tooth with partial pulpotomy using white mineral trioxide aggregate. J Interdiscip Dent 2015;5:79-82. Oz IA, Haytaç MC, Toroglu MS. Multidisciplinary approach to the rehabilitation of a crown-root fracture with original fragment for immediate esthetics: A case report with 4-year follow-up. Dent Traumatol 2006;22:48-52.